"According to October 2010 data from The Nielsen Company, 29.7 percent of U.S. mobile subscribers now own smartphones that run full operating systems. 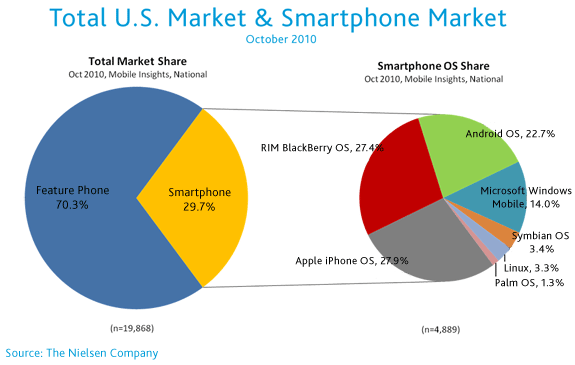 The most popular smartphones are the Apple iPhone and RIM Blackberry, which are caught in a statistical dead heat with 27 percent of smartphone market share in the U.S. Twenty-two percent of smartphone owners have devices with the Android operating system"
Interesting - last I'd heard the Feature Phone market still had about 10% higher saturation, so it looks like the era of the Smartphone will soon be upon a much wider spread of Americans than ever before seen. So what are your predictions for the other circle? I see Green + Blue taking up some space soon to be vacated by Red, and perhaps even eating into Grey!